AngularJS, an open source web development framework from Google, is used to build Single-Page Applications (SPAs). With the power of analyzing the page DOM and use of Angular-specific element attributes, AngularJS delivers cleaner codes which are easy to understand and less prone to error. A reputed Web and Mobile App Development Company in India, Webguru Infosystems leverages the power of MEAN Stack (MongoDB, Express.js, AngularJS, and Node.js) to develop dynamic and robust web applications. Avail our AngularJS development services for building secure and functional web & mobile applications those are easy to maintain. We are a leading AngularJS development company in India providing scalable, dynamic and secure web applications. Whether you want to build a web app from scratch or you wish to integrate AngularJS to your existing website, we can craft the perfect solution for you. The AngularJS developers at Webguru Infosystems create feature-rich and sophisticated Web Applications at cost-effective rates. Avail our AngularJS web development services for an interactive website or functionally rich web application that is fast and user-friendly. Development with AngularJS requires lesser coding resulting in faster develpment and execution. Availability of rich set of various modular libraries helps to create clean and maintainable codebase. The two-way data binding between HTML and AngularJS ensures faster rendering and better user experience. With the inclusion of Object Oriented Paradigm on and from Angular 2, the codebase has become modular and scalable. 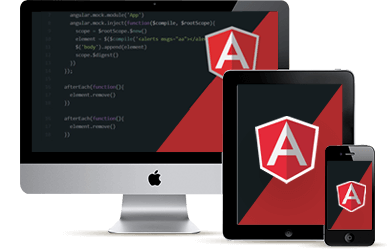 Web & mobile apps developed using AngularJS Framework are compatible with all browsers and devices. Webguru Infosystems is an ISO 9001:2015 certified company with a team strength of 150+ developers, analysts and project managers. Our team stays with you from start to finish of the AngularJS web & mobile app development projects to ensure a delivery that matches your business requirements precisely. Talk to our expert AngularJS web application developer for your business requirement. We will be happy to assist you.